In winter of 1450, Paris was invaded. Not by an invading army. But by a pack of man-eating wolves. Intense feudal agriculture and poor game management practices in the forests had created an ecological catastrophe. 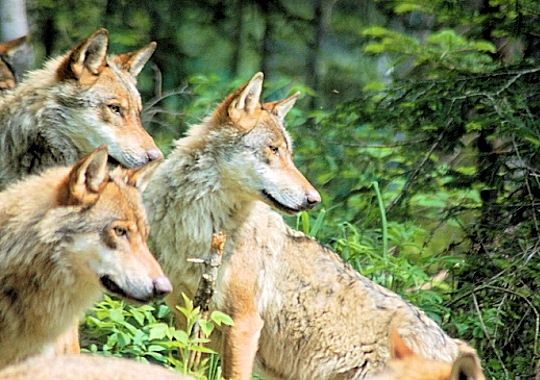 Fewer deer and wild boar were around to feed the rapacious appetites of France’s wolves. To make matters worse, France had suffered over a century of brutal warfare over ownership of the French crown. (This was the so-called Hundred Years’ War that was really series of wars over a 116-year period). As a result of all of that warfare, the French people were under an extreme burden to survive. The farms and forests were pushed to their limits to feed the population. And that meant an increased burden upon the wolves. For some reason, the government in Paris has refused to repair its walls, which had been erected several centuries before. It would have made sense that they would have constantly kept them up, considering how long armies had been fighting over the control of the French crown. The walls also kept the fell beasts of the forest out of town, but now, a pack wolves had slipped into the city. Wolves that had been starving in the forests often turned to raiding livestock for survival, but in France– as in most of Europe at this time– most of the peasants were unarmed. It didn’t take some wolves long before they learned that humans were a perfectly acceptable prey species. Women and children were prime targets because they were smaller and less likely to injure the wolves when they attacked. And that is why this wolf pack entered Paris in the winter of 1450. Before their reign of terror was over, about 40 Parisians would fall to the wolf pack. And in a major urban center, such events would cause mass hysteria. Plenty of stories about the wolves spread throughout the city. Lots of things can be said about Courtaud. Perhaps he was a wolf hybrid. Some French dogs do have naturally short-tails, which has survived most strongly in the Brittany and the Braque du Bourbonnais. The red color could also point to a dog ancestry. However, it is more likely that Courtaud was an Iberian wolf, which are often quite red in color. We all know that wolves disperse over great distances when they leave their natal packs. Wolves in North America occasionally travel over 500 miles from their parents’ territory to find suitable territory. An Iberian wolf born in the Pyrenees could have easily made it to Paris in search of a new territory. In a time when wolves were widely hunted with dogs and all sorts of traps were set for them, it could be very easy for a wolf to lose its tail. Cortaud also could have lost his appendage in fights with other wolves, which are known to occasionally grab the tails of their opponents as they try to flee. With around forty people dead, the government had to act. A group of the boldest Parisians got together and went on an urban wolf drive. They pushed the wolves into the Île de la Cité. And then drove them into the front of the Cathedral of Notre Dame. In front of the citizenry, the wolves were speared and stoned to death. And the wolves’ bloody reign of terror ended. Discussing the existence of wolf attacks is very hard to do rationally. In North America, the vast majority of the public views the wolf in a very positive light. It is almost a totemic animal that has come to represent the wildness that is our continent as well as our enlightened efforts in conserving our natural heritage. This view is direct contrast to what the wolf once symbolized in every Western country– and virtually all of those in Central and Eastern Asia. (Mongolia being an exception, of course). To Europeans, the wolf represented the most dangerous of animals. The animal that could easily kill all the sheep in a flock then rip out the shepherd’s flock. Within the popular culture, there were many stories of wolves attacking people. There are documented accounts in the Old World. Some of them are outright fictitious or extreme exaggerations. One should not forget that propaganda about wolf attacks would have been very useful in maintaining the feudal system. Serfs were not property and did possess within them a certain amount of free agency within feudal law. At some point, they could decide to go off as free yeoman in the forest, even if they were still legally bound to the manor. The possibility of being attacked by wolves is a very powerful weapon to use to keep people from wandering off the manor. In the early days of feudalism, it could be used to encourage peasants to accept the “protection” of a lord. And some of these attacks are very clearly the case of rabid wolves. Rabid wolves would be those that attack whole droves of people, doing nothing more than biting them. In a time without rabies vaccines or any way of preventing the disease, the mere sight of a wolf had to have been a terrifying experience. But these Parisian killer wolves were hardly rabid. They were engaging in pack hunting behavior. Just this time, they were hunting people, not their normal prey of boar and deer. Wolves in North America rarely hunt people, and when I say rarely, I mean almost never. They are much more a threat to domestic dogs than they are to people. Dogs are viewed as trespassers, and wolves regularly kill interlopers. And often eat them. But North America has much better managed ecosystems than Europe does, and this was certainly the case in the Medieval Period. And France in the mid-1400’s was a very bad place to be. The vast majority of the population lived just a step above starvation, and poaching in the forest was commonplace, even during a time of peace. During a time of war, things were that much worse. Courtaud and his band of man-eaters were living in a forest that was in ecological catastrophe. An ecological catastrophe in the midst of a human world that is full of social and economic catastrophes. Those who were most vulnerable in that society were those most likely to fall prey to the wolves. With no weapons to defend themselves, it really isn’t much of secret why wolves would hunt people. People would be easier to kill than any livestock. We don’t have horns or sharp tusks, and we can’t even run all that well. How common these attacks were in the history of Europe is still questionable. However it is through that lens that the first settlers to North America viewed the wolf. And it is through that lens that virtually all people living in Eurasia viewed them. It is only when these countries became relatively affluent and political freedoms were extended to the vast majority of the populace that the wolf’s position in society changed. It became that totemic symbol of conservation. Its totemic status is so strong now that to even mention the possibility of wolf attacks will result in severe pillorying. It is almost heresy to mention that such a thing could happen. But they have happened and do happen. That does not mean that we should allow those attacks to allow another wave of wolf persecution to happen. We have to say that wolf attacks can happen. They aren’t very common. In North America, they are far, far less common than bear or shark attacks. And certainly less common than domestic dog attacks. But to deny the possibility is just intellectually dishonest. To make such bold statements such as the oft-repeated “Wolves have never attack people” is really risky business. Wolves are complex animals that learn much of their behavior. To make broad statements about an animal like a wolf is really not wise. That bromide can be repeated until it becomes a meme. But what happens when a wolf or a pack of wolves kills someone? (As happened in Alaska last winter). It is simply better to say that wolves rarely attack people. And of all the things one should worry about, being attacked by a pack of wolves isn’t really a major priority. And because North America has lots of things that prevent wolf attacks from happening– we have lots of prey species and our people are generally well-armed– we shouldn’t really worry too much about wolves. However, wolves in other parts of the world might be more willing to consider people prey, and we have to recognize that reality. Economic, political, and ecological factors can push wolves into hunting people, and it is best to understand how those exist within that dynamic, rather than denying the existence of wolf attacks. The best book I have read that discusses this dynamic is David Quammen’s Monster of God. It discusses all of many different political, economic, and ecological factors that lead to potential conflicts between people and predators. Wolves are not an example in the book, but the section that most resembles the story of the wolves of Paris is the case of the Maldhari people and the lions of the Gir Forest in India. The Maldhari people are very poor herdsmen, and those herdsmen who are the most impoverished are those who are most likely to experience losses from lions. They are the most likely to be forced to graze their stock in lion country, because those who are more established can graze in lion free areas. Like the peasants of Medieval France, these people are the edges of society. They are the ones who are most likely to suffer from nature in the raw. To solve these problems, we must fine away of changing the status of these people and providing them some security within the system. It is only then that people will be able to live with the large predators, regardless of what they are. I think u wrote that mostly to be provocative, because it has many holes in the wall. So-said. But let’s look at it. 1st, it’s foolish to speak about the year 1450 as a good example about how we should react and feel about the wolves now. There are many reasons for that. In those days, even big cities as Paris, with its 300 000 people, were badly managed. There were no hospitals, kindergartens, senior- or madhouses, or any communal welfare policy, except the church. Due to that, there were certain amount of people always “hanging in the streets”, without any self-protection cunnings. Nobody really cared about those people who were killed, or why do you think it took 40 people’s life before the City reacted? – Paris population in 1450 was ab. 300 000 so the human waste was a big promblem. It was thrown outside the city wall. So, the so-said holes in the wall” were not the problem. It was the mountanous waste heaps all over the town. They created a serious safety problem – which could mean the attack of the English, robbers and other criminals. Contrast to that, your story sounds a little odd. There was that great wasteland to share for the wolves and wild dogs. So the attacks may have so happened there in the wasteland, NOT in the actual city. -Working class spent most of their time working outside. Kids, often only 5-10 years old, were sent for small duties and to the near town fields to sheperd the cattle. Domestic dogs run free every where in that time. They grow easily wild and when there are tens of others, they make packs and get hunting. Naturally, people abondoned dogs in the winter when the food was scarce. Your factual reference to the relatively small Iberian wolf is ridicolous. Most easily it was a wild-gone dog. -In more rural areas, since skins were valuable, it was common to trapp wolf-cubs in the spring time to raise them in cage. The wolves were slaughtered in the mid winter, just when they are getting their heat, when their fur is at its best. In some cases, wolf-accidents may have been dued to this. In the nature animals eat other animals. We should determine, in a clear argumentation, are we accepting it or not. If we want be part of the link of the nature’s great feeding system and the recycle, we have to accept that. So, if we want to live with the wolves in this planet, we have to accept that it may happen once in a year or once in a 100 years, that a wolf eats a man, in a country, in the world. Is it hard to imagine to happen, to be killed by a big, furious, yellow-eyed scary beast? Or is it just easier to accept to oneself to die in a car accident? We do accept the fact that different kinda viruses, parasytes, insects, snakes, domestic dogs and humans, kill tens of thousands of people in the western world every year. We try to compete, but seems we can’t win in the final game. We stand it wiht other animals. With our dogs. We are not demanding that all dogs should be killed, after one has killed a person. And we seem to want that a young shooter, after having killed a kid or two, may get another chance after the reasonable punishment. It is so curious, if other animals may kill people, but a wolf can’t never in a hundereds of years. When it has killed, of course, every specie of it has been kicked out off many countries like Germany, the U.K., Ireland, Finland. This was one of the best and most fun to read posts i have seen here in a year or two. Awesome. Likely vs. Scary is a fun debate to have with irrational people. So I’m likely to get lots of hate on this one. Let me make it clear: Do not use this post for wolf persecution purposes. I can write similar posts on sharks, which are far more dangerous to people. Yet we all know form Shark Week that sharks really aren’t that much of a danger in the grand scheme of things. But i already ordered the leg traps and booked the helicopter. Thanks for nothing. Not too many wolves in your part of the world…. 1080 is what you need for wolves. I don’t really know who is irrational in this blog. May be You? the post was irrational, or rather, a bit fictional. For instance, the red docked-tail canis was assumed to be an Iberian wolf, tho’ nobody knows. It is – in Retrieverman’s imagination. You are one of them. I tell you that here in my country in Finland there are now some 200 wolves. So many are the wolf-haters like you. U don’t have to show me Wiki, coz I’ve studied biology, etology, philosophy at University, and of course, our Canis. I’ve been in the trad. skiing-tour after wolves’ tracks in the snow many times, but haven’t seen any alive. To me a wolf is a wild dog, the dog of forest, and a functional pack predator. So what you want to point out with that Wiki, especially? That, in India, in 1996-97, 74 people, mostly prepubescent children were killed by wolves? Or that in France, in the year 1450, 40 people were said to killed by the animals? Or that in Estonia, in between years 1804-53, wolves killed 111 people, of which 108 were children? The world has changed, we have changed, the wolves have changed. For instance, modern people don’t have that many kids any more. Note, that most of the victims in the history were KIDS! And why?? Because many women and familys just could not take care of their many kids. They were also abandoned – fed to the wolves. Also, it was typical to put an under-10-years-old kid “to the forest” to herd the cattle to the fields and back home or so. Read please the statistics right – and be critical to them too, not ONLY towards me. The sums are of course not perfectly right, and there are reasons behind them, that count. If you were a trained researcher, you must know that. In many cases, it was the clergy that kept the book about the deaths – and, think, what that coiuld mean but just “the truth”? Please get serious. We don’t have tens of thousands of Wolves living in our western world any more like it was in the 1800s and earlier. I say it again. We are not the food for the Canis. If there is elks, caribou, reindeer and so, he will choose them 1000 x rather than us. It is more likely that you get driven over by a car or train than you see a wolf alive – or know personally someone who suffered his attack. Hey Bridget. No offense meant – just wanted to show that wolf attacks are real. Wolves aren’t good or bad – just predators. And I love them too. I’m just researching the event. Also in the question of the human nature, that quality is a traditional philosophy of science piece to be argued about. A classic I’d say. I just mean that in some countries, wolves have been driven into the edge of the non-functional, un-healthy size of population. For instance in Sweden, the animals are suffering from severe symptoms of in-breeding. The case may be same in Norway, but they don’t want to talk about it much, since sheep-farmers seem to be more important to the politicians than the wild nature. In Finland, the national travel agency used wolves in their advertisement, but that is living in a lie, since the truth is all the Lappish wolves have been killed, mainly by poachers. The wild animals / wild nature need badly people to talk about these kinda problems. Unless they will be lost. Humans, as a specie don’t need that, we really are so plenty of. This all I say as a biologal / ecological fact – I’m not making a decision, which one is good or bad. It’s naiive to assume that a person talking about wolves like me doesn’t know that they have eaten people, and will do in the future too. Like, cars have killed people, and will do in the future too. The basic difference is, nature’s creatures are unique while humans’ creatures are really not – and this goes as well with the domestic dogs, sheep – or cars. Please note: All of that about 1080 was a joke! You do more harm than good with this. The Paris wolf story would make a pretty cool movie, I’d think. Though if it was made now, they’d probably spice it up and make them werewolves or something. Then I googled. And that book came up. There were plenty of bodies for wolves to eat– not just from war but from all sorts of diseases. Dat’s right, people get hot by hearing one word about wolves. Why? We have heard and red all those stupid stories about the Little red Hood (which actually may tell about pedophilia, not wolves, see) to Lewis’ Narnia stories. It has turned out to be very boring to me for a long time ago. It is an official, communal enemy n:o 1. Even in N.Y. and Sweden, where only 200 wolves live – all too in bred, small in size – genetically un-healthy. It is the year 2011, not 1400. It is te time when it seems the man has already wasted and spoiled almost the whole planet and its natural resources. Still many are foaming in their mouth about the case Canis Lupus. THAT is irrational, if nothing. You should get that book-very entertaining and very plausible–from an animal behaviourist’s point of view. You should also get “Wolves In Russia”–a very, very different view(with justification) from North American views on wolves, where only ranchers as a group tend to be so negative towards them. I am afraid that as wolves repopulate more and more of their former range in the West/North, circumstances are such that more attacks are inevitable. You put unarmed, naive urbanites with little or no practical woodcraft or real knowledge of wild animal behaviour out “recreating”–in other words, oblivious of everything except just their desire to have fun or get some excercise–with several very efficient top predators(wolves, cougars, grizzlies) who have become habituated and lost their fear of humans, and yeah, bad stuff is going to happen! I just hope the naive, unrealistic Nature lovers will still love Nature(including its magnificent top predators capable of eating them!) enough to not go on an exterminating campaign every time someone gets nailed–instead, try harder to learn to live with them and take the necessary precautions when in their territory……..
Oh no. I dunno if that will do. The population should rise more than 10 x if something like that should happen. If thre are plenty of big game, wolves hunt them in the deep woods. Only young and lonely ones tend to visit near houses – and don’t you think that they are wanting to bite your flesh there, no. The Russia is a case in its own class, it is the Canis Lupus Storage of the Europe. In Turkey, wolves have been reported regurlarly damaged or killed people in remote farms. The reports seem to be imperfect, so it is hard to figure out what is going on there. Something to do with the goat farming? Man and wolves fighting? Man-eating wolves? Wolf-dogs? The great Canadian bear researcher Lynn Rogers has claimed that actually bears’ attacks get rarer the more they get used to humans. His argument for that is that the attacks happen only in the farest perferia. In so many cases, that makes sense with the wolves too. I don’t believe in the Paris wolves – legend too much. For, it’s sure that in those days people fed, frankly speaking, they handicapped relatives and unwanted kids to wolves. And when the clergy came to ask about it, it was very easy to blaim the beast. Human or his ape-relatives is NOT the pray animal of the Canis and they have not ever been it. I have no other sources, except Peter Steinhart’s book, The Company of Wolves.